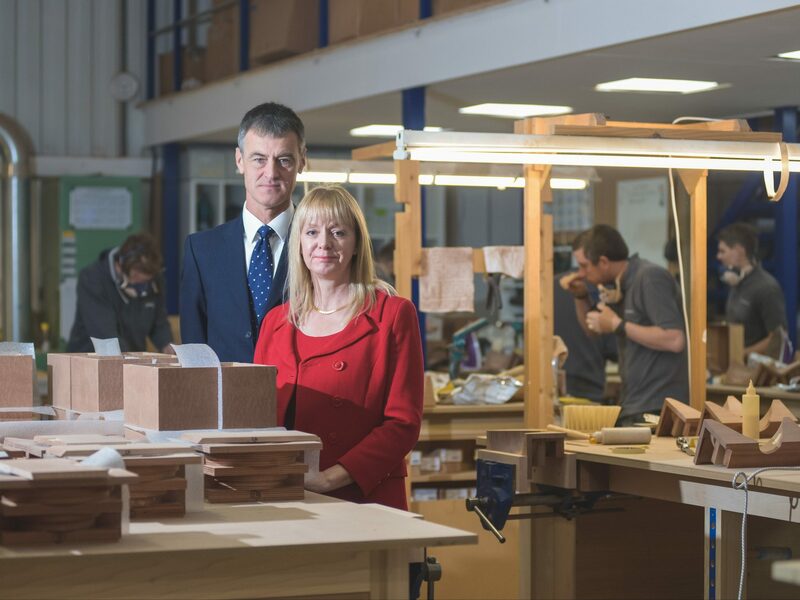 A highly-skilled cabinet making and joinery business in Warwickshire is investing £750,000 in its growth and is accelerating its expansion thanks to local support. NEJ Stevenson, based in Church Lawford, designs and makes custom furniture as well as creating bespoke interiors for premier residential properties. The company even has a Royal Warrant and is a cabinet maker for HRH Queen Elizabeth II and has diversified into offering premium containers for luxury drinks which has grown from nothing in 2013 to £1.5m worth of sales. NEJ Stevenson has grown to employ more than 30 staff, expanded its premises and made significant investments in new machinery to help improve its processes after support from Business Ready through the University of Warwick Science Park. Business Ready supported the firm with grant applications through the Warwickshire Small Capital Grant and also from the Rural Development Fund in order to purchase a new sanding machine, a CNC machine and spindle turner, as well as offering general advice and support. Managing director Neil Stevenson said the help had speeded up its growth plans. He said: “Janette Pallas from Business Ready contacted us to see what our plans were and whether they could support which was great. “In the past, we’d try to go for grants and look for help but we were always told we were doing too well or were not in the right area so we had all but given up on getting support. “But Business Ready has been absolutely invaluable and we have been able to grow quicker than we would have done without the help and that’s good for the local economy. “Janette has helped identify funding opportunities, helped us to make sure we apply in the right way and we have been successful. “As well as the grant-funding and the general advice, it is reassuring for us as a business for someone to show confidence in us in this way and believe in our growth strategy. On the softer side, it’s nice to be a manufacturer that’s not in the automotive sector and still feel some love. The company is also keen to give back to the local area and is working with schools and colleges to provide opportunities for young people to learn more about manufacturing. And the firm is on the hunt for more new recruits to help continue its growth. Janette Pallas, of Business Ready, said: “NEJ Stevenson is a fantastic success story for our region and proves that we remain at the cutting edge of manufacturing in this area. They are an example of a business that still use traditional skills, but also use advanced technology in design and manufacturing. “Their support for schools in helping young people to understand differing roles in manufacturing businesses is to be commended and we would urge other companies to do similar.